Try this nutritious meal of our high-fibre mix veg curry made with 10 different kinds of veg like high-fibre haricot beans, carrots and baby corn. It's served with a kofta curry that has multiple eat.fit twists. The koftas are baked, not fried, they are made with lauki instead of potato, and they're enveloped by a thick gravy that has no cream or butter. 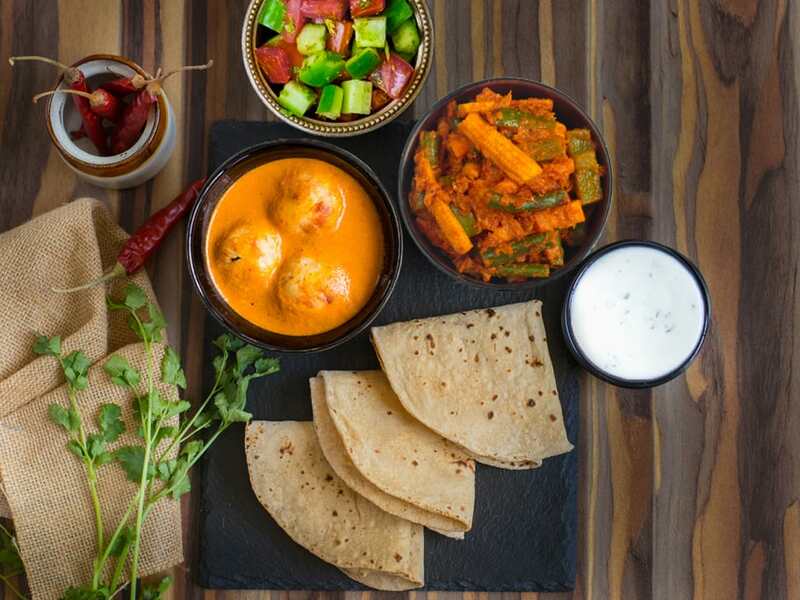 You can scoop up the winning duo with some nutritious rotis as you enjoy a side of refreshing salad and tummy-cooling raita. - High-fibre mix veg - Koftas baked, not fried - 100% whole wheat rotis - Low-fat yogurt raita Served with the superfood of the day. Allergen Information: Contains gluten, dairy, mushrooms and nuts. *Salad and raita may vary from those pictured. Also, nutrition values may vary slightly based on the salad and raita of the day.